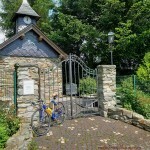 Two full months later, the Chapel of Hearts was finally open when the blogger biked by. It is apparently a Heart that is supposed to be for each and all of us – for mankind in general. The chapel itself is tiny. But it is only part of this place and what it is supposed to mean: The tiny garden and the patio-like seating area, they are all integral parts as well. 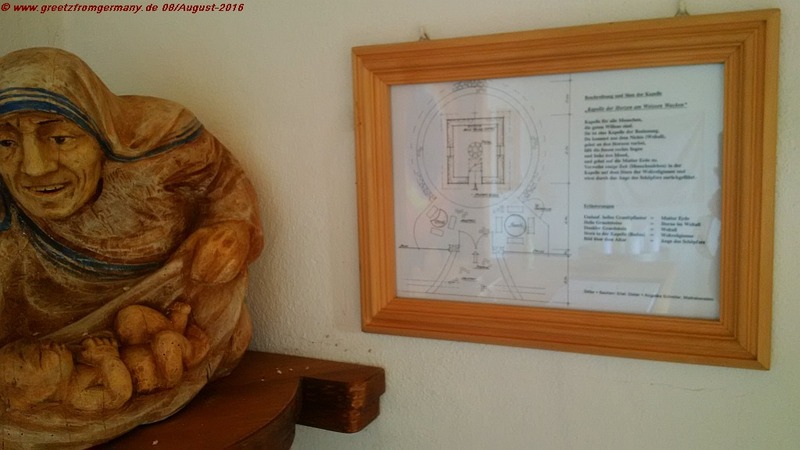 And together, as is explained in the chapel, they symbolize Mother Earth and some of its spiritual ‚children‘ which are meant to provide every human being with a place to find peace of body and mind – independent of whether this person believes in any god or not. In essence, this is a refuge to temporarily rest body and soul in. And it’s meant not to worship a particular God in, but to demonstrate Heart to Mankind as such, represented by each and every human being who cares to set foot into the building. Out of curiosity (like the author) or out of need for a quiet place or in seeking shelter from the sun or anything else burning down on us every now and then. How befitting to thank Mother Theresa in this Chapel of Hearts – which actually is a Chapel to Mankind -, as she was one who had a heart for anyone of us humans, no matter what. 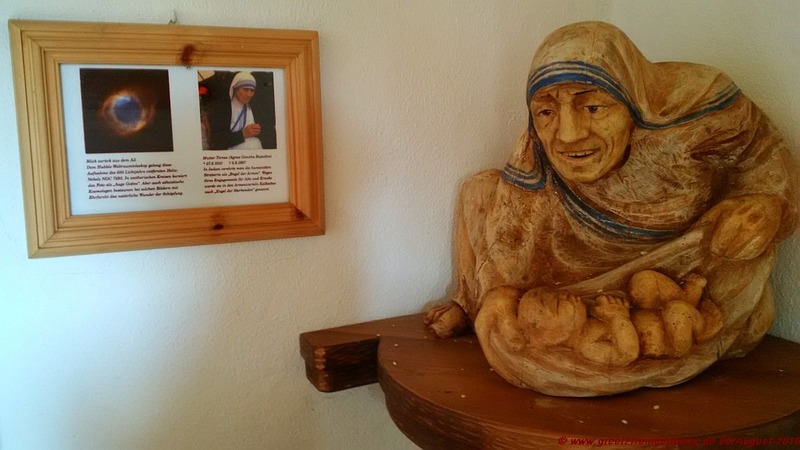 In this context, it suddenly makes sense that there is an – albeit crude – wooden half-statue of Mother Theresa. Not because she was a Christian nun. But to remind us of all the good she did to any of the poor of Calcutta. And in doing good to them, she showed heart for mankind, over and over again.